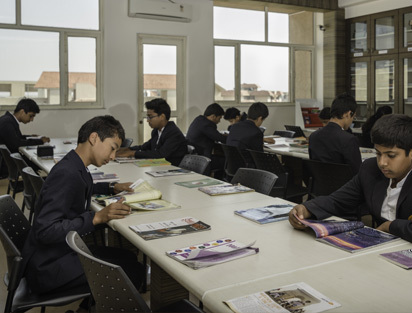 Classrooms at NH Goel World School are vibrant learning spaces designed to support the physical, social, emotional and academic growth of children. Each classroom combines the best of available indoor and outdoor areas to maximize learning. At the school we have an AV room with education modules from JIL information Ltd which help to present the various topics in an interesting audio-visual format. 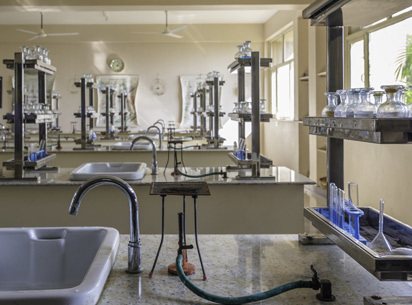 The school has a well equipped and modern Science and Mathematics lab which help children to indulge in experiential learning in a broader sense. We completely understand the importance of I.T. knowledge in present day and to further it and make the kids well versed, we have a well equipped computer lab with individual system for each child. The school is also commencing the language labs to help children work on their language skills in a more indulging way. The emphasis in library classes is to nurture a reading habit. Apart from the Central library, individual class libraries have also been created in each classroom. All students take part in library Classes in the course of the school week. Our librarian will work with the students to teach them proper library etiquettes and help them to appreciate the need to handle books and library materials with utmost care. Students are encouraged to issue books from the main library, as well as the class library, that they will enjoy reading and that are at an optimum reading level for their age.